Upgrading from Biopsy to Radical Prostatectomy in Low Risk Prostate Cancer Patients. Appliying Real World Evidence for Adecuations of Guidelines in a Single Center Based on its Own Experience. Today´s Guidelines propose the Radical Prostatectomy as an option for healthy patients with Low Risk Prostate Cancer. Prior studies assessing the correlation of Clinical Stage, Gleason score (GS) and PSA value at diagnosis and its corresponding outcomes after radical prostatectomy (RP) predated very different results. 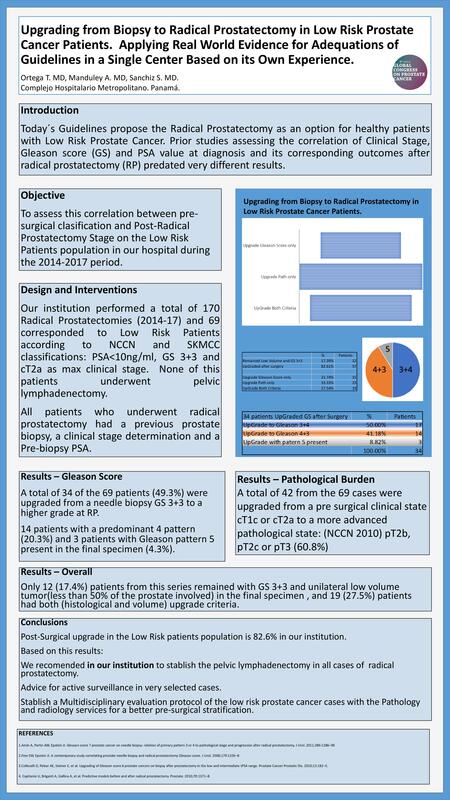 To assess this correlation between pre-surgical clasifficaction and Post-Radical Prostatectomy Stage on the Low Risk Patients population in our hospital during the 2014-2017 period. Our institution performed a total of 170 Radical Prostatectomies and 69 corresponded to Low Risk Patients according to NCCN and SKMCC clasifications: PSA<10ng/ml, GS 3+3 and cT2a as max clinical stage. None of this patientes underwent pelvic lymphadenectomy. All patients who underwent radical prostatectomy had a previuos prostate biopsy, a clinical stage determination and a Pre-biopsy PSA. The study team was not involved in informing the patients of the diagnosis or treatment options. The relation of upgrading to patient and cancer characteristics were planned to be compared using the chi-square test, Student t test, and multivariable logistic regression in the aplicable cases. A total of 34 of the 69 (49.3%) were upgraded from a needle biopsy GS 3+3 to a higher grade at RP. (49.3%). 14 patients with a predominant 4 pattern (20.3%) and 3 patients with Gleason pattern 5 (4.3%). A total of 42 from the 69 cases were upgraded from a pre surgical clinical state cT1c or cT2a to a more advanced pathologycal state (60.8%). Of the patients that were Low Risk by pre surgical stratification remained low risk after surgery. And 19 (27.5%) patients had both upgrade criteria. Post-Surgical upgrade in the Low Risk patients population is 82.6% in our institution. In the Up-Graded cases, 49.3% had High Grade GS and 60.8% were pT2c or higher. Based on this results, we recomend in our institution to stablish the pelvic lymphadenectomy in all cases of radical prostatectomy, with an upgrade rate far above from literature reports, the Benefit for the 82.6% of upgraded patients overcomes the overtreatment for the 17.4% that remain as “REAL” Low Risk after surgery.